﻿ christmas traditions in Salzburg Austria and see how we do celebrate. 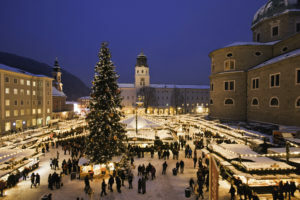 In Salzburg we have a lot of wonderful christmas traditions, which are completely different to the ones in the US. We already begin with the Christmas time at the time of Advent with the Christmas markets by the end of November. We have of course the well known “Krampus” or “Percht” in this area. Originally the “Percht” is a ugly figure with horn and fur to scary the winter ghosts. It is an old tradition which should protect the people before the strong winter times. Very similar in actual times – but a complete different figure in history – is the “Krampus”. This is just the companion of the Holy Saint Nicolaus. Also known as “Knecht Ruprecht” who is here to punish the bad kids, while the brave ones get their presents on the 6th of December from Saint Nicolaus. 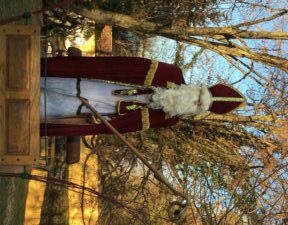 Saint Nicolaus is looking very similar to Santa Claus in the US or in within english speaking world. With his red coat and the white beard he looks trustful and gives a good feeling to everyone. In Salzburg you can also find the FURIOUS HUNT on the 2nd Thursday during the Advent season around the Untersberg mountain. More details and some pictures you’ll find on our Blog. It is an honor if you can see them. The christmas markets can be found in nearly every village. Especially in the main cities you can find a lot of markets with small huts, which offer presents, the well known spicy wine (“Glühwein”) and of course a lot of delicious warm and cold dishes. 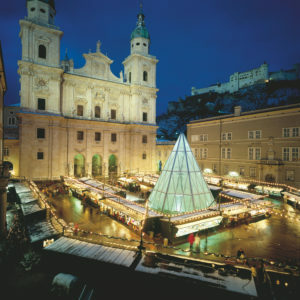 The most famous christmas market is the big one in Salzburg city in front of the main cathedral – the Dom. 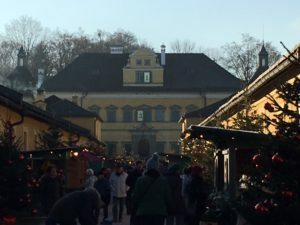 We have a lovely one at palace of Hellbrunn which is integrated in the barock styled palace area (right beside and around the Gazebo of the famous sound of music movie). And of course the small hidden one directly in St. Peter’s Abbey – you enter it at the way to the oldest restaurant St. Peters (for sure the oldest one with ongoing restaurant business here in Europe – status at the moment to check with one in China to get the title the oldest one in the world). In addition you find in this area something very special – the so called “Turmbläser“. These are musicians that play folklore music with horn blowers. They are often standing on the top of a church tower (therefore the name “Turm”) so that they can be heard by everyone around. 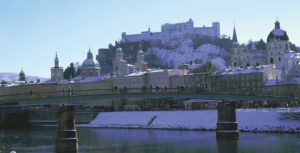 For example on the christmas market at the fortress Hohensalzburg you can hear them playing every weekend. One of the oldest traditions in this area are the so called “Rauhnächte”. Beginning with the 21st of December the so called “Thomas Night” followed by 12 nights of magic till the 5th January. In this night the portal between heaven and earth, today and yesterday and also between human and animal should be open. There is also the magic, that the animals can talk to humans on the 24th of December and can tell you things about your future. Especially here in the mountains, this time was rather cold and dark. The winter solstice is the beginning of longer daylight again and therefore the traditions say to turn on the lights, the candles and go through the house with olibanum and other ingredients to fumigate. It is the tradition that patriarch is going first with the things to fumigate and everyone of the family follows him praying to god. This should be against bad ghosts and bring luck to the next year. 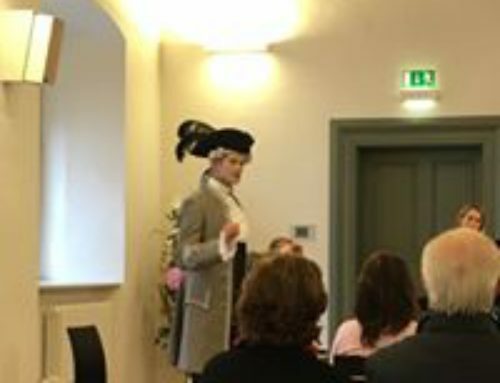 On the 24th of December you can also hear the “Prangerschützen” which is also an old tradition in Austria to shoot at the Christchild. At 12.00 noon time they use their small cannon to give the tribute shoots for the Christchild, that the Christchild find her way to the homes of the children. They also shoot on the 31st of December to give a tribute to the old year and welcome the new year. About this is the movie on youtube if you follow the link. A lot of families send their Daddies with the kids away from home on the 24th afternoon, so that the mums can prepare the christmas tree in the living room and they can tell the kids then the Christchild was delivering it. Therefore you find a lot of events for the kids on this day noon/afternoon time. For example the visiting of the Salzburg Airport with special attraction for the kids or the Salzwelten Hallein with a Christchild angel in the middle of the mine. This is how we celebrate in this area. Perhaps the Christchild is the main difference to Santa Claus in the US. We celebrate christmas eve on the 24th of December and after a typical lunch – Noodles soup with “Mettwürste” (I will come back later to this receipt) – the children find their presents brought from the christchild unter the christmas tree. Which is of course a green fir tree and mainly a real one in this area, taken directly from forests. We also use still real candles. 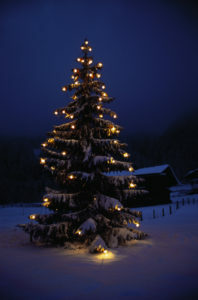 Of yourse, also the plastic tree industry and the led-lights become more and more popular, but fortunately not everywhere. We as b(e)specialtours for example will have a living tree from last year, which stayed on our terrace outside during the summer time and is now a bit bigger than last year. So ready to wear the candles of beeswax and the swarovski Stars. Bernd is collecting them by years and so our tree becomes more and more stars year by year. This is a typical dish in Austria/Salzburg on the 24th of December. As in former times the 24th was officially a day of abstinence, they are cooked after the midnight mess on the 24th with a warm beef broth with typical sausages “Mettwürstel”. Nowadays the main population is not waiting any longer for midnight and prepares the lusty beef broth already for dinner before the bell is ringing – which means the Christchild was coming. But the 24th is in Salzburg still a day of abstinence. The big christmas family lunch times start then on the 25th of December. The “Mettwürstel” is a special kind of sausage, which you can only get at the butchers between the 24th and 31st December. But mainly on the 24th it is a very fresh and very comprehensive sausage of pork and beef meat. The special thing is, that it is not ready cooked. The sausage you usually get is pre-cooked and you only need to warm them up. But the “Mettwürstel” is raw and when you prepare it for dinner, it is the first time when it is cooked. So the taste is much fresher and of course better than the usual sausages. The 24th till about 11pm is time for family. So if you are in Austria for holiday, be prepared that a lot of restaurants and locations are closed. The younger generation start at about an age of 15 years to go out after family celebration and make a christmas party in the bars. This is mainly from 11pm onwards and of cours the atmosphere is different to every other day in the year. They all start to hug and to wish everyone a merry christmas and the classic “Last Christmas” song from WHAM is on every playlist on this day. So, we b(e)specialtours wish you a MERRY CHRISTMAS! Enjoy your time dears!